were keyed by graphic images and/or text: The Woodpile, (1979) and Hearst Strip, (1980). The photo was taken by Bruce Handelsman for a 1980 exhibition at the Berkeley Art Center and also used in "Stories, Information as an Artists Material", Whole Earth Review, Winter, 1987, pp. 48-49; and in "Uncle Roger, an Online Narrabase", in Roy Ascott and Carl Eugene Loeffler, Guest Editors, Connectivity: Art and Interactive Telecommunications,Leonardo 24:2, 1991, pp.195-202. 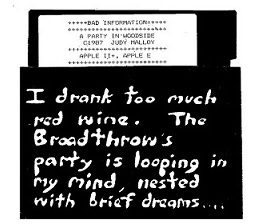 "A Party in Woodside", File 1 of Uncle Roger, was first released on Art Com Electronic Network on The Well in 1986. It was Published on ACEN Datanet and on disk in 1987 and first exhibited in Montreal in 1987 at Ultimatum II, Images du Futur '87. The BASIC version of the entire Uncle Roger was first exhibited in the travelling exhibition Art Com Software: Digital Concepts and Expressions, curated by Carl Loeffler. Art Com Software began at TISCH School of the Arts, New York University from November 4-22, 1988 and then traveled to San Jose State University, the University of Colorado, Ars Electronica in Austria, and Carnegie Melon University. Uncle Roger was also exhibited in ARTWARE, at A Space, Toronto, Canada, April 6 - May 6, 1989. In the spring of 1986, I was invited by my friend, video and performance art curator Carl Loeffler, to go online and write on the seminal Art Com Electronic Network (ACEN) on The WELL where -- with a focus on electronic publishing for experimental art and literature -- Carl and Fred Truck were setting up an online system that would include discussions, such as "Software as Art", and ACEN Datanet, an early online publication that would soon feature actual works of art, including works by John Cage, Jim Rosenberg and my own Uncle Roger. Once in a while in a lifetime, everything comes together. In 1986, it was my experience in database programming, the idea I had been working on since 1977 of using molecular narrative units to create nonsequential narrative, the availability of personal computers that would make what I had been trying to do with "card catalog" artists books more feasible, and the arrival of ACEN, a place to create, publish and discuss the work. The writing of Uncle Roger File 1: "A Party in Woodside" was begun in August 1986. By co-opting (with permission) an entire discussion system topic on ACEN on The WELL, A Party in Woodside was first told on Art Com Electronic Network on the WELL, beginning on December 1, 1986. In this version, each lexia was posted online, along with the links associated with it. The idea was that readers could pull the text and keywords into their own database software. Howard Rheingold set up a parallel topic to discuss Uncle Roger and how to implement it. Some actually did. The writing of Uncle Roger was influenced by the experimental artists books I had been creating; by the narratives that I performed in the early 80's -- using live spoken word accompanied by slides that were tableau photographs of characters, who appeared and reappeared on the slide screen -- and by scene-based Renaissance comedy. In later works. 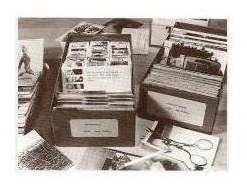 I wrote hypertextual lexias differently, in its name was Penelope, for instance, creating with words the filmic photographic imagery developed in the "card catalogs". Yet twenty-eight years after it was first told online on Art Com Electronic Network on The WELL, Uncle Roger remains redolent of the vibrant early online network on which it was produced. As Uncle Roger begins, The narrator, a young woman named Jenny, has come to California from the East Coast as a babysitter for the family of Tom Broadthrow, who owns semiconductor-related industries both on route 128 outside of Boston and in Silicon Valley, California. It is the mid seventies in the little-documented era before the advent of Internet biz, when the chip industry ruled The Valley, and there was intense competition over who could make the fastest chip. The Broadthrow family live in Woodside, a small town in a wooded area South of San Francisco where other wealthy Silicon Valley CEOs also live. Several threads -- a love story; the California chip culture; contrasts between the East and West coasts; and the activities of Jenny's Uncle Roger, an eccentric semiconductor market analyst -- weave in and out of the narrative. In A Party in Woodside, during the course of a dream-laced night after, Jenny remembers a party at the Broadthrow's house. Because nights of insomnia often follow unsettling experiences -- and replay them as dream and memory fragments -- such long and sleepless nights can approximate nonlinear narratives. The party, as parties usually are, is experienced in fragmented scenes. As at any party, the reader may see some occurrences but not others; may meet some of the people but not others. As at any big party, neither the narrator, nor the reader understands every observed action. Yet as the reader explores the narrative, an individual picture of the party emerges. The original A Party in Woodside was a database of 75 lexias which was searched by keywords, resulting in chains of links -- ie, the reader followed a link chain of lexias about "Uncle Roger" or any other phrase of his or her choice. It was flexible -- for instance, the Boolean operator "and" was incorporated so that combinations of links could be searched -- ie "Jenny" and "Uncle Roger". And it was elegant in an historic Apple II and early online systems sense. In Silicon Valley, things do not happen simply and clearly. In File 2 of Uncle Roger, The Blue Notebook, parallel yet intertwining narratives advance the story in sometimes conflicting ways -- reflecting the increasing complexity of Jenny's life. The story is framed by a formal birthday party for Tom Broadthrow in an elegant hotel dining room. The party is punctuated by an encounter with Uncle Roger in an unlikely place. And while Jenny sits at the banquet table, other narrative threads -- a car trip with an old lover, a visit to a semiconductor house in San Jose -- come and go in her mind. Parts of the story are taken from Jenny's notebook where reality is difficult to separate from fiction and dream. As Jenny herself says: "The things I wrote in the blue notebook didn't happen in exactly the way I wrote them." Terminals was written shortly after the time when computers had replaced typewriters in corporate offices. In this File, the narrator, Jenny, has left the Broadthrow family and started working for a market research firm in San Francisco. As she sits at in front of her computer at a desk in large room in an office building, memories of a Christmas party in Woodside, time spent with Jeff, a trip back East for the holidays; and other things that happened in the last month, come and go in her mind at random. In the original telling of the story, a random display of lexias simulated the diffuse, unsettled quality of the narrator's changing life, where the reader had no idea of what would happen next, and in the end, an unpredictable relative was the deus ex machina. In the web version of Terminals, the random number generator (technically a pseudo-random number generator) used in the original version is simulated by a set of unlabeled computer keys. To read the story, click on any key. The story can also be paged through (approximately in the order it was written which was not entirely sequential)by clicking on the "typewriter bar" at the bottom of the screen. 2. GWBASIC. In addition to DOSBox, you will need GW-BASIC (or equivalent) in order to read Uncle Roger. A copy of GW-BASIC is included in the .zip file of Uncle Roger. It can also be downloaded various places on the Internet. 3. UNCLE ROGER. Download Uncle Roger. Download the .zip file of Uncle Roger. The Programs that comprise Uncle Roger are in this file. They are: PARTY.BAS, (1986) BLUE.BAS, (1987) FILE3.BAS, (1988) and UNCLE.BAS. (Menu program, 1988) All these programs were given some small tweaks in 1991 which are incorporated in the emulator recreated version. 4. Install Uncle Roger. Create a directory called uncle Note that the directory must be called uncle or you will not be able to return to the main menu. Unzip uncle_roger_basic.zip into uncle This will create the main menu in the uncle directory, as well as the files in 3 subdirectories: party, blue, and terms. Click on the DOSBox icon. If you would like to view the work in full screen, the toggle command is alt-enter alt-enter will also return the work to a smaller size. At the OK prompt in GWBASIC, type run "UNCLE.BAS"
You will need to include the quotes. Select 1 to go to "A Party in Woodside". Follow the prompts to explore the story from the link list. When you are ready to move to the next file, type stop at the prompt to return to the main menu. Select 2 to explore "The Blue Notebook". "The Blue Notebook" is read in the same way as "A Party in Woodside". When you are ready to move to the next file, type stop at the prompt to return to the main menu. Uncle Roger on the World Wide Web, 1995, 2011. Twenty-eight years since it was first created on Art Com Electronic Network on The WELL, Uncle Roger lives on in the World Wide Web version. Resonant of the early Web, this version utilizes the web's display clarity, its inherent hypertextual nature, and the ability to reach wide audiences that the Web has made possible for web-based works of hypertext fiction. After you select a character, thing or place from the links, you can follow that link through the party by continuing to select it. Eventually all of the lexias so-linked will be read, and the path either returns to the beginning or to somewhere on the same link path. Minor characters often appear in the form of a short loop that simulates repetitive memory of unexplained or disturbing incidents. Or, to experience the party more diffusely, you can select any link at any time in the reading process. Additionally, clicking on the graphic icon, will follow a trail through the party in the order that each lexia was written. 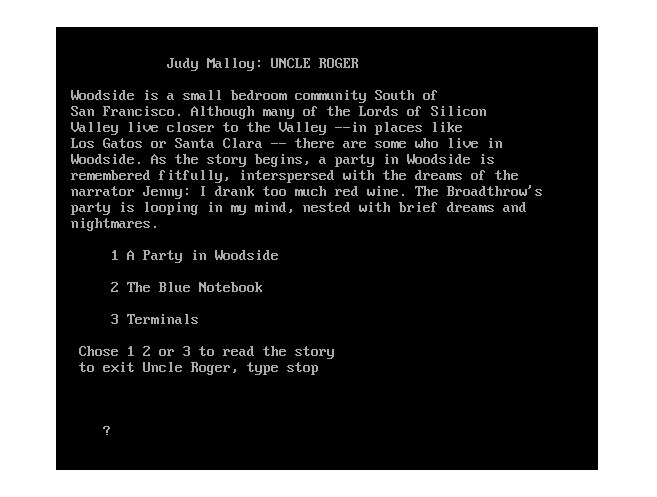 (which is not necessarily sequential) And there is always an option to return to the original menu by clicking on "Uncle Roger" at the bottom of the screen and then selecting A Party in Woodside. 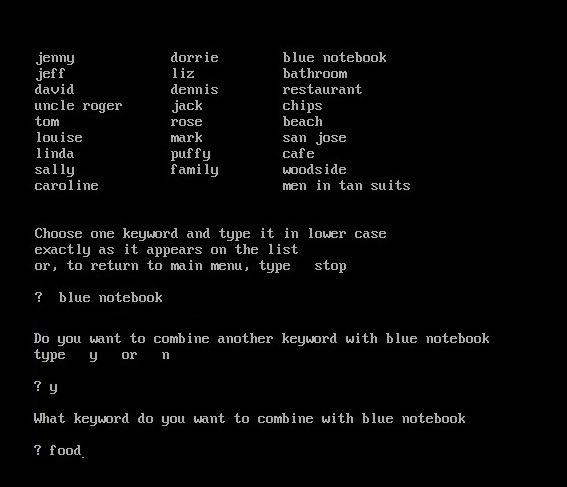 Based on the interface for A Party in Woodside, the original versions of The Blue Notebook were created with a database of lexias which was searched by keywords, resulting in chains of links. 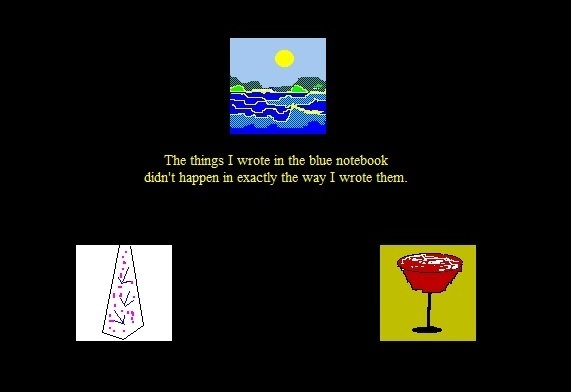 But in 1995 when the World Wide Web version of Uncle Roger was first created, for The Blue Notebook, I wanted to take advantage of the visual aspects of Web that were unavailable in the text-based systems where Uncle Roger was first created. Thus -- based on the icons that I used to key narrative in early Card Catalogs (illustrated at the beginning of these notes) -- the web version visualizes the links as a choice of graphic icons. To read the story, the reader chooses an icon and clicks on it to produce another lexia. Continuing to click on the same graphic image approximates the trail that the reader followed by selecting keywords in the original version. In the web version of Terminals, the random number generator (technically a pseudo-random number generator) used in the original version is simulated by a set of unlabeled computer keys. To read the story, click on any key. The story can also be paged through (approximately in the order it was written which was not sequential) by clicking on the "space bar" at the bottom of the screen. These notes on Uncle Roger were last updated on October 1, 2014.